As someone who has just entered the world of postdoctoral research, I registered for the “careers in science” workshop organised on the heels of ICCB 2018 at CCMB, Hyderabad, with a lot of curiosity. In hindsight, I am quite glad I attended the workshop, as it presented a fantastic opportunity to learn about the various careers open to science graduates, from the very people who have explored these options and are now established in their own niche areas. The workshop was organised by IndiaBioscience and DBT-Wellcome Trust India Alliance. 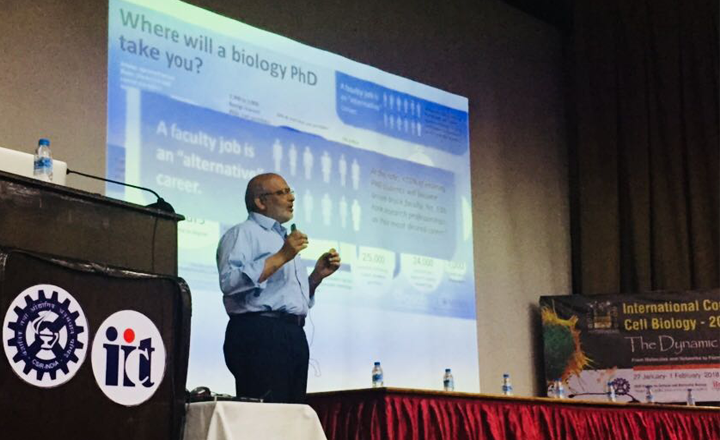 Shahid Jameel of India Alliance started the session with a short introductory talk, where, he emphasised on the need to look beyond academic careers in science. First speaker of the day, Smita Jain, Associate Director at IndiaBioscience, talked about various career-related e-resources available on the IndiaBioscience website. Ever since, I have been a regular to their website which holds a good repertoire of fascinating videos and a very informative booklet on careers in science. The Young Investigator Meetings (YIMs) she mentioned, would be extremely useful to young postdocs for networking with senior faculty members from institutes across the country, mentorship and community building. Jain also spoke about careers in science administration and management. She stressed on the need to “introspect before making a career choice” and eventually choosing something that resonates with your personality. The second talk of the day was delivered by Suveera Dhup, Grants Manager at India Alliance. Dhup took us through her personal journey, that started as a PhD student at National Institute of Immunology followed by a postdoctoral stint abroad and finally a chance encounter with somebody gave her the idea to apply as a Grants adviser at DBT-India Alliance. She also elaborated on the skills required in a grants manager and gave the audience a lowdown on what she loves and hates about her job. Coming from someone who has made a career shift from bench to an allied science field, this talk was definitely a great inspiration for people in the audience who were thinking of changing tracks from core academia. I was personally quite enthralled with Chitra Ravi’s talk- the third speaker of the day, who is also a faculty at Azim Premji University. After a very long time, I saw a person who did not use any presentation aids and yet could hold her audience in rapt attention for around 25 minutes. She talked about educating science teachers to help improve their pedagogy. This is something I had never thought about before and found to be quite interesting. She also talked about her experience as the co-editor of iWonder, a magazine for middle school teachers. Her work involves interaction with teachers to help them integrate experiential learning into their classrooms. Subhra Priyadarshini, Editor of Nature India, spoke about science journalism as a career option. She elaborated on medical and technical writing in media houses, publications and companies that recruit science writers. It was quite reassuring to know that a huge platform like Nature India actively encourages PhD graduates and postdoctoral fellows to contribute write-ups or do internships to get a hands-on experience in science journalism, before making the crucial career jump. She ended her talk with a short audio from Nature India podcast on the pioneer of DNA fingerprinting, Dr.Lalji Singh. Podcasts, still at a nascent stage in India, as she pointed out, are again a great opportunity for outgoing researchers to tap in and carve a niche for themselves. Arun Chandru’s talk gave a great insight into what it takes to start and run a startup. After a doctorate in aerospace engineering, he changed tracks to co-found Pandorum Technologies, a life science-based startup, working on designing artificial human tissue. He spoke about the challenges he faced in securing funding for their start-up, their vision of developing complete organs for medical research and therapeutic applications and gave a brief about the incubator, Centre for Cellular and Molecular Platforms (C-CAMP), where Pandorum Technologies is located. Chandru also said that a lot of government grants and other forms of financial support is now becoming available for deep-science driven startups, all you need to do is to “attract it”. Lastly, a career talk by Shyam Suryanarayan, from SciTal, addressed the issue of employability and career readiness that students ranging from bachelors to PhD face when looking for opportunities outside academia. A basic personality type check, such as the Myers-Briggs Type Indicator® (MBTI®) could be a good starting point for those who are not sure which jobs they could fit in. He also summarised a range of job opportunities according to personality type, which I could immediately put to use in my own ongoing job search. The tea and lunch sessions provided a great opportunity to meet and interact with the speakers for one-on-one discussions about specific queries. The enthusiasm and the genuine interest of all the speakers to help students in any way they could, was definitely palpable in the environment. More such career workshops in various institutes will be a great guidance and exposure to life science students. Choosing new careers in science - nothing “alternative” about it! Digital imaging ethics: Where does India stand? Are we reaching the ‘public’ with our public outreach programs?